‘Chindia TMT Dialogue 2018′, the annual convergence platform for India-China businesses will be held in JW Marriott, New Delhi on September 28, 2018. NITI Aayog CEO Mr. Amitabh Kant and Chinese envoy to India Mr. Luo Zhaohui will deliver keynote address along with other key stakeholders. An elite panel of speakers across the startup industries of India and China will share their experiences and challenges they faced on their road to success. The event will see participation of 500 plus delegates consisting of entrepreneurs, startups and investors across India and China. The last two editions of Chindia TMT Dialogue held in Delhi and Beijing have had witnessed participation of over 1,500 delegates. “Draphant is looking forward to hosting hundreds of startups founders, employees, angel investors, and aspiring entrepreneurs from across the country to be a part of one of the most happening annual gathering dedicated to technology and cross-border learning in India, and facilitate knowledge sharing between India-China businesses.”, said Amit Li, Founder & CEO, Draphant. India-China bilateral trade was valued at $84.44 billion in 2017. Also, in the past year, Chinese companies invested about $2 billion in India as compared to $700 million in 2016, tripling the funding in a single year. 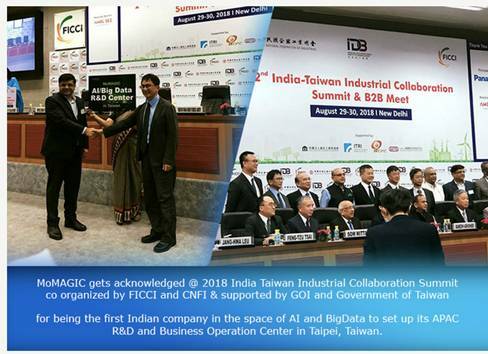 Leveraging the Chinese ecosystem with the help of investors is turning out to be a game-changer in terms of knowledge sharing and not just sourcing capital. Since China and India have remarkable similarities in terms of consumer spending behaviour, on the market-scale it is the China model that Indian entrepreneurs are finding success and depend on. Given the recent success of investments, FDI from China could potentially grow by 4-5 times in the next five years and Chinese companies could very soon become one of India’s top foreign direct investors. Founders, CEOs and senior functionaries including Mr. Abhiraj Bhal (CEO, Urbanclap), Mr. Gautam Sinha (CEO, Times Internet), Mr. Kavin Bharti Mittal (CEO, Hike), Mr. Maninder Gulati (CSO, OYO) Mr. Sujayath Ali (CEO, Voonik), Mr. Umang Bedi (President, Dailyhunt), Mr. Deepit Purkayastha (InShorts), Mr. Karan Bedi (CEO, MX Player) are several other key speakers will be present in the conference from Indian side. Senior functionaries from Alibaba Cloud, Xiaomi, Bigo, Yoozoo will be amongst the key speakers from Chinese side. The conference would also include fireside chat and panel discussion on crucial topics ranging from E-commerce to Fin-Tech, investment, content and enterprises SaaS among others. Giving a big boost to the startup ecosystem, the third edition of “Chindia TMT Dialogue 2018′, the annual conference organized by Draphant.